I finished five books last week. Five wonderful books. 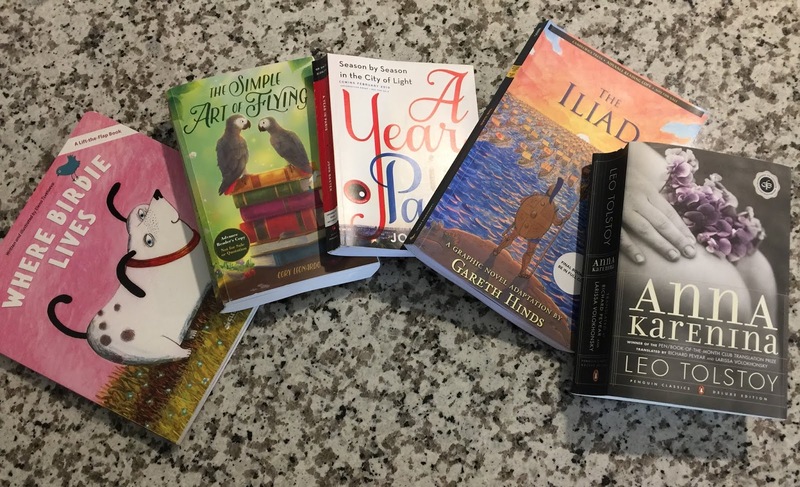 Have I ever had such a wonderful reading week? I heard it called the world's best known soap opera. I heard it called the world's greatest novel. It's the world's greatest novel. It's a brilliant intertwining of characters, characters who are as fully human as you can ever get on the page. There is Dolly Oblonsky, a matronly wife who has lost her husband's affections and doesn't know why and doesn't know what to do. There's her husband, Stiva Oblonsky, the womanizing yet charming fellow who can't stop flirting with women and can't manage money. There is Kitty Alexandrovna, the woman at the height of her beauty who is intrigued with the easily-bored Count Alexei Vronsky. There is Konstantin Levin, a country farmer, confused about life, estranged from religion, and deeply taken with the young Kitty. There is Alexei Karenin, the dutiful husband who seeks guidance about what is right. And there is Anna Karenina herself, the title character, who is swept up in a mad romance with Count Vronsky, and has to deal with the consequences, a situation where no move is a happy one for herself or for anyone else. "I shall go on in the same way, losing my temper with Ivan the coachman, falling into angry discussions, expressing my opinions tactlessly; there will be still the same wall between the holy of holies of my soul and other people, even my wife; I shall still go on scolding her for my own fright and being remorseful for it; I shall still be as unable to understand with my reason why I pray, and I shall still go on praying; but my life now, my whole life apart from anything that can happen to me, every minute of it is no more meaningless, as it was before, but it has the positive meaning of goodness, which I have the power to put into it." I can see that I am going to be pushing everyone I meet to read this book. I apologize in advance. It's, after all, over eight hundred pages. But it's worth it. It's definitely worth it. The Iliad is a cautionary tale for our time. It's an old story, from around the twelfth century B.C. and the reader can't help but feel glad we don't live in times such as these. Men grow angry with each other. They steal others' possessions. They seek vengeance for wrongs done to them. They attack each other, and they are vicious in their attacks, slashing with spears, brutally killing and maiming. They go to war against each other, and their wars last for years. They relish the cruelty they do to others. They seek the help of the gods, who are just as petty and vindictive as the humans themselves. Yes, it's an old story, and the reader can't help but feel glad we don't live in times such as these, times we slash out at our opponents, times we delight in the cruelty we inflict on others, times we seek to build walls to protect ourselves, walls that oh-so-easily tumble and fall when the violence breaks out between conflicting tribes. This book is a cautionary tale. There may be no better guide through Paris than John Baxter. 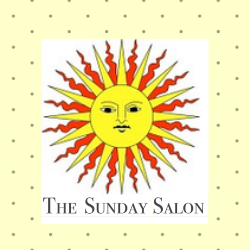 He is an outsider and an insider, able to look at Paris with both the objective viewpoint of an onlooker and the heart of a Paris lover who has been invited to partake of the secret joys of the Paris life. 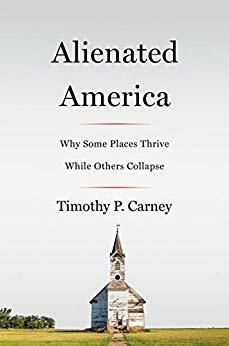 He is a researcher and a writer who can combine the history of Paris with present-day Paris, the intellectualism of Paris with the bawdiness of Paris, the glory of Paris with the horrors of Paris, the reality of Paris with the mystery of Paris. Baxter formats A Year in Paris around the seasons, and he travels between the past and the present day to create a rich portrait of the city. Baxter draws upon the new calendar created by ne-er-do-well Philippe Fabre d'Eglantine after the peasant revolt of 1789 to underpin the seasonal rhythms of the book, and he shares story-after-little-known-fascinating-story about Paris people, Paris places, Paris events. It's a joy and a delight of a book. "Hi birdie! Are you flying home? Where do you live?" 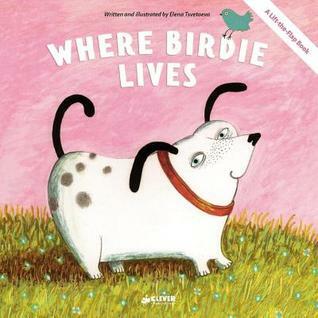 A huge, friendly dog follows birdie and tries to discover where birdie lives. The pictures zoom in close to apples and leaves and lily pads and burrows and trees, with little flaps for lifting, so children can experiment and check themselves and play while reading this little board book. It's a beautiful little adventure, with a satisfying ending, that children will want to read over and over with a parent or caretaker. The story is told from all three points of view (Aggie, Fritz, and Alastair), and it's told through three different genres (Aggie writes letters to her dead husband, Fritz writes journal entries, and Alastair writes poetry). It's a rich story, with deeply flawed characters who (yes, even the parrot) are decidedly human. You won't find a fresher approach to a children's book this year. I've read just one. Now to track the John Baxter book. 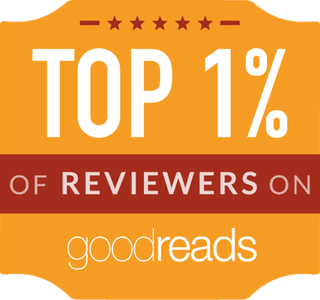 Anna Karenina-- wow, wonderful review! I've seen several bloggers reading it/chatting it up as a long-term classics club choice. 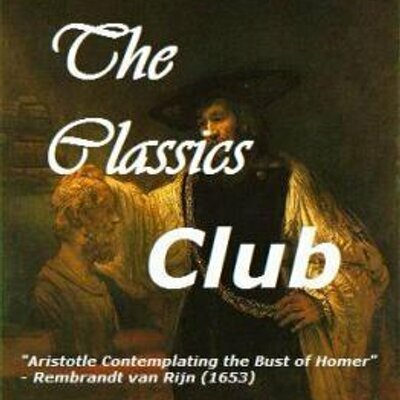 I will admit to not being a lover of the classics, though I've read my share in H.S./college. But you've made me want to give this one a shot and see if I can follow through. Thank you. These all sound wonderful! And, I love how you described The Iliad. What a fabulous take on the Iliad, Deb - you're absolutely right... I'm deeply grateful I didn't live in that time as woman, anyhow. They were treated appallingly. And I also enjoyed reading your passionate reaction to Anna Karenina - I read it faaar too many years ago, but I recall surfacing from it in something of a daze. 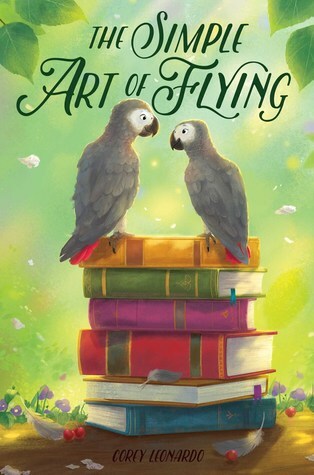 But the book I loved hearing about the most is The Simple Art of Flying - it sounds wonderful. I hope the coming week is also full of wonderful books! It has been so long since I read Anna Karenina that I should read it again. I had to nod my head about The Iliad adaptation, and how we should be glad we're not living in times like those. Maybe our slashing out and cruelty are different these days...but then again, not that different. Anna Karenina has been on my TBR since I was a teenager. One day, I will get around to reading it. Glad to hear you enjoyed it! Lovely books! I've had my eye on Anna Karenina for awhile but haven't quite gotten the courage up to read it. I had to read several Russian novels in high school and I think I was just too young to really understand them so I have a bit of a mental block against them. We did watch an adaptation of War and Peace a few years ago and I loved the story so my mind has slowly been changing. Have a lovely week! Well done!! I've only read one - Anna Karenina - and that was many, many years ago. I read it around the same time as reading Dr. Zhivago and I think I liked it better than Pasternak's novel. I'm currently reading The Cruelest Month by Louise Penny. I have finally fallen in love with her Three Pines Series!! Can't put it down! Nice! I loved Anna Karenina. Wow!! You sure read a lot of awesome books! I really need to read Anna Karenina! I read Anna years ago and loved it. 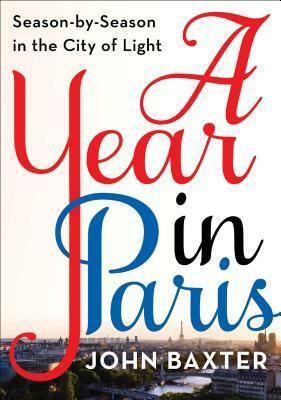 I added A Year in Paris to my TBR. Those are some amazing reads. I read the Anna book a long time ago. I've been thinking of rereading some books from my early years to see how I feel about them now that I'm older. What a wonderful week! I don't think I have accomplished that one yet. Maybe my tops has been 3. I am glad you had such a wonderful week. Have a great coming week too! I think I would to read Anna Karenina by Leo Tolstoy. Five books?! That is wonderful!! I haven't read Hinds's version of The Iliad, but his version of The Odyssey was excellent. Thsi week I read one book: The Marrow Thieves by Cherie Dimaline and it will definitely be on my best of 2019 list. I’ve read The Iliad twice and was horrified by it both times. I’m very happy that I’m not part of that world. I’m not brave enough for Anna Karenina yet. It would take me forever to finish that book. Have a good week! I'm not brave enough for Anna Karenina but I'm glad you loved it! I'm also jealous that you read 5 books! That's amazing, I've been in a reading slump for a couple weeks now. I hope you have a wonderful week. 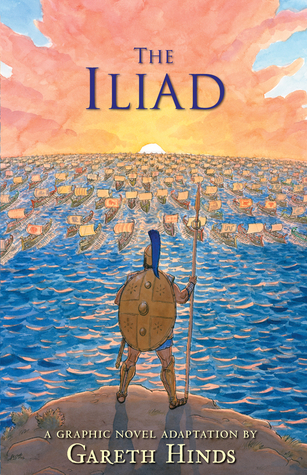 I finally got up the courage to read the Iliad last year (Lattimore translation) and enjoyed it very much, though the middle chapters dragged a bit. Perhaps Homer could have used an editor! One thing that struck me was how timeless it was: much of the story was driven by a dispute between Agamemnon and Achilles. Today we would call their dispute a p*ssing contest and I've seen a lot of them. Times change but certain behaviors don't. Anna Karenina is on my shelves since a few (or more) years. A lot of people are reading and talking about it now, so maybe I should try to read it this year. I am sure I will love it. I read half the Iliad than lost the book. While moving I found it again (in a place I would normally not look for a book!) so will try to finish that one as well this year. Read Odyssey and liked it.